Code 9 Gold & Caviar Essence & Gold Box Tightening Pack Kit contains all the features of a luxury product. Conceived by Neogen Dermalogy line, from packaging to formula this product is all about premium experience. 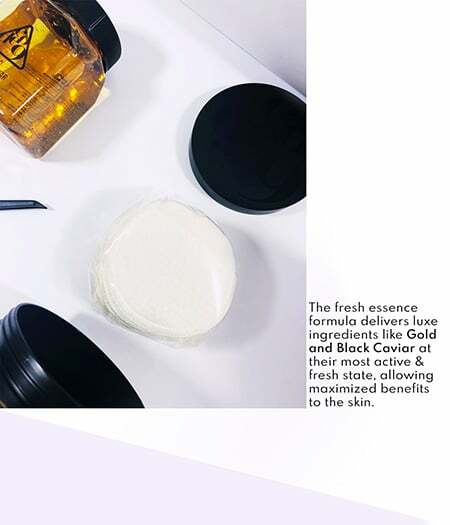 Gold Black Caviar Essence contains 99.5% pure gold and super black caviar complex delivering a healthier, younger and glower complexion a blink. Another plus, a super fancy packaging composed by a concentrated essence and a Flakes Gauze-Pack Pad. But what makes it so special? Let’s dissect this product together an find out. Code 9 Gold & Caviar Essence & Gold Box Tightening Pack Kit is Neogen’s luxury nourishing and exfoliating, two-stage facial skin care kit that was created for effective exfoliation and skin delivery of active ingredients. 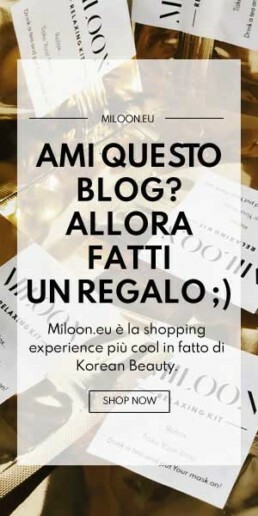 We examined this product on the second episode of Miloon’s K-Beauty Guides. Just check it out to retrive more info and comparison with other essences. When it comes to performance, Neogen Code 9 Gold, Black Caviar & Gold Tax Tightening Pack Kit is alla bout extensive care. These are the amazing results you can achieve right after the first use: improvement of elasticity, lifting effect in the chin area, anti-wrinkle effect, improvement of viscoelasticity of the skin, improvement of blood circulation, moisturizing, brightening, improvement of skin texture. 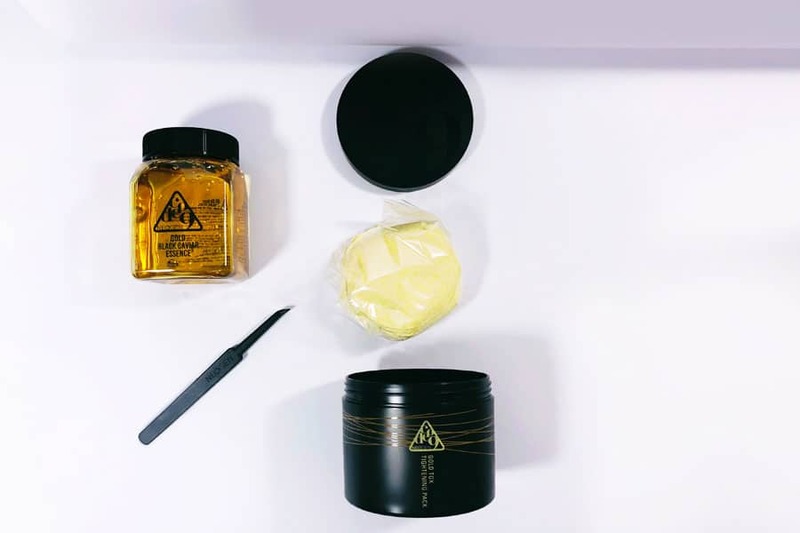 Code 9 Gold & Caviar Essence & Gold Box Tightening Pack Kit includes an highly concentrated essence based on gold and black caviar and a Flakes Gauze-Pack Pad. The essence comes in a big jar (250ml), multi-layered pads (25 pieces) and tweezers are included. 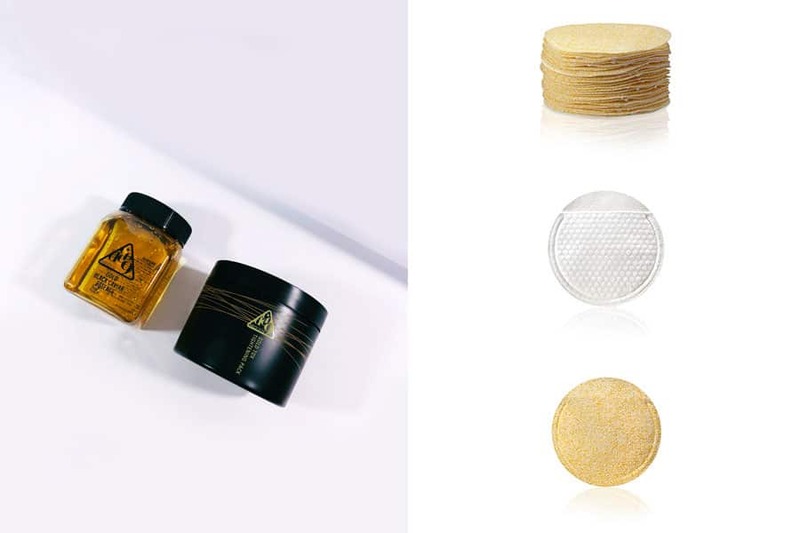 Those pads help to manually exfoliate as you apply the essence formula to your skin. Tweezers helps to pick up each pad so you don’t have to stick your fingers into the jar. The first thing that could strike your attention is that the essence formula and pads are separated. In fact, these kits were designed with the intention of reducing and minimizing the oxidation process of the essential ingredients by packaging the essence formula in a separately sealed container, so you can freshly open and pour right before you start using. Let’s give a look at all the beneficial ingredients that this essence has to offer. First of all it is paraben-free, sulfate-free, EU Allergen free. It contains retinol, yes retinol. Who doesn’t love retinol? It is acne fighting, brightening and anti-aging at the same time. Another acne fighting ingredient is Glycyrrhiza Glabra (Licorice) Root Extract. It has 5 brightening ingredients, apart retinol that we mentioned before, the essence contains Glycyrrhiza Glabra (Licorice) Root Extract, Niacinamide, Morus Alba Bark Extract, Morus Alba Fruit Extract. Neogen included the following anti- aging agents: Niacinamide, Adenosine, Glycine Soja (Soybean) Seed Extract, Tocopherol (Vitamin E), Retinol. The following ingredients have been used to help with with the skins repairing and regeneration process: Panthenol, Centella Asiatica Extract (CICA), Sodium Hyaluronate, Vitis Vinifera (Grape) Seed Oil, Achillea Millefolium Extract. We found out that these products are really performative for dry and oily skin types. zOne thing we noticed is that if it comes to sensitive skin types, it has some ingredients that potentially might irritate sensitive skin types. For example Citrus Aurantium Dulcis (orange) Fruit Extract might be excessively acidic and potentially irritating for sensitive skin. The same as Citrus Paradisi (Grapefruit) Peel Oil and Citrus Limon (Lemon) Peel oil. WHY THIS PRODUCT IS SO SPECIAL? Anti-aging, Lifting, Boosting Elasticity, Improving Skin tone, Improving Skin Texture, Detoxifying, Proven 50hour Lasting Moisturizing, Nourishing and Glowing. Code 9 Gold & Caviar Essence & Gold Box Tightening Pack Kit was designed to provide professional skin care results with at-home convenience. You will receive fresher and elevated skin benefits throughout the complete duration of use achieving a brighter, ultra-hydrated, firmer, and healthier skin than ever! – Helps with blackhead removal. – Helps in facial lifting. – Helps reducing the sebum level. – Helps reducing the oil level. – Helps decreasing the skin temperature. – Helps improving the skin texture. 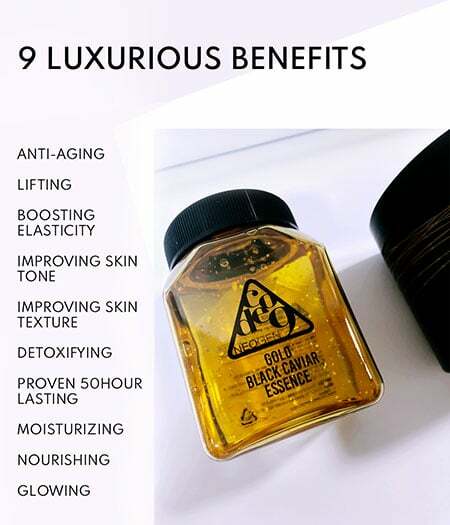 We hope that now you know everything about Code 9 Gold Black Caviar Essence & Gold Tox Tightening Pack Kit by NEOGEN and you are ready to GLOW. Just imagine that all those benefits and all those results you can achieve using just one essence. Could be out there something more special?